Saturday, October 8th was a great day for the Kielbasa crowd in Toledo. 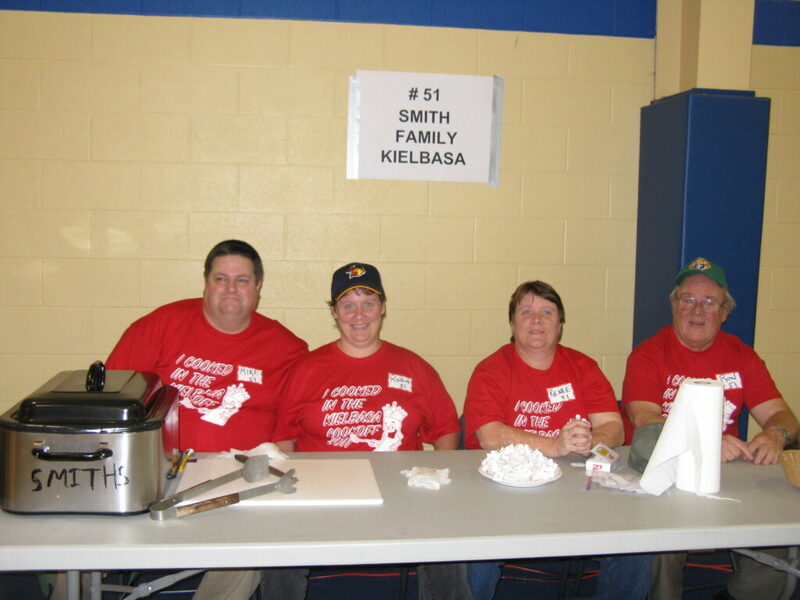 The 2nd Kielbasa Cook Off was held at the Donnely Family Neighborhood Center at Blessed Sacrament Church. Twelve amateur kielbasa makers vied for the coveted title of “Kielbasa King”. There was no shortage of kielbasa and everyone was able to purchase kielbasa samples along with other great Polish food like kapusta, mizeria, placek and Cruchinki. After sampling the kielbasa, the votes were cast and the people of Toledo have spoken! The new kielbasa king is Shawn Zaborski’s Polish Village Kielbasa. Second place winner is the Smith Family Kielbasa and third place winner is Domanski Klassic Kielbasa. Congratulations to the new Kielbasa King and all of the contestants. The votes were very close this year which means all of the contestants offered great tasting kielbasa. We are planning next year’s Cook Off already so all of you amateur kielbasa makers in the Toledo and Northwest Ohio and Michigan, make plans to compete in next year’s cook off. You never know who will be the next kielbasa king. It could be you. October is Polish Heritage Month! Polish American Heritage Month was first celebrated in 1981 in Pennsylvania. Originally, August was the month selected to focus in on the contributions of great Americans of Polish descent that were often not recognized. Michael Blichasz of Philadelphia, a fourth generation Polish American, started in an effort to bring to the forefront the strong pride he believed all Americans of Polish heritage should have in the successes that Polish Americans have made in America. Polish American Heritage Month became a great success in Pennsylvania and in 1986, it was made a national campaign and the date moved into the month of October. The change was made to allow school children to take part in the month long celebration. Polish Americans and Poles in America now had a way to express their spirit in a truly American way. In Chicago, streets, parks, schools, government buildings, have been named in recognition of the contributions of Polish Americans but now an entire month focuses the attention of all on ourselves. It is important not to single out those like Pulaski and Kosciuszko, heroes to both Poland and America, but to focus in on your friends, family and yourself. As everyone of us have contributed to the success of America, now is the time to show others who you are, where you came from, and what you do. Teachers, scientists, athletes, businessmen, politicians and diplomats, artists, writers, actors,.. the list goes on for ever and in it, include yourself. Speaking to others, let them know you are proud of your heritage, from where you, your parents, grand-parents, great grandparents come from. The contributions made to America, from the first Polish settlers in Jamestown, Virginia as craftsmen and artisans, and leaders in the fight for representation, to astronaut Dr. James Pawelczyk, third generation Polish American and mission specialist for the latest missions of the space shuttle, are immense. football – Chicago Bear Bronko Nagurski. The list is endless – from the first governor of Alaska, Wladimir Krzyzanowski, to actress Stefanie Powers.